This Solution Spotlight provides an overview of how enterprises are dealing with mobility and security (from bring-your-own device to choose-your-own device programs) and explains the pros and cons of each from a business risk and management perspective. 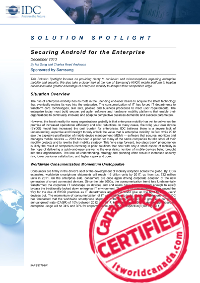 Download Securing Android for the Enterprise to learn why IDC believes the solution lies with the development of mobile operating systems (OS) that provide for their own security, such as that developed by Samsung. Find out why the Android platform is poised to become a key player in the enterprise mobile device space by 2015, and how Samsung, with leading marketing share and a secure OS has overcome a fragmented Android ecosystem and the challenges in security and manageability – empowering IT to regain some control.